Last week, the 51-year-old chain opened a restaurant with a coffee bar, grab-and-go meals and trivia. Menion TGI Fridays to its regular customers and they’ll have no trouble conjuring an image of the casual-dining chain: dark-wood interiors, kitschy antiques on the walls, plenty of noise and the standard pub grub of mozzarella sticks and strawberry daiquiris. This atmosphere has served the restaurant well for decades now—and why shouldn’t it? Isn’t TGI Fridays where people go after work to loosen their belts and knock back a few? Sure—but maybe not for much longer. Last week, the 51-year-old chain opened the doors of a new prototype in Corpus Christi, Texas, and it’s a big departure from the usual candy-stripe awnings and red Naugahyde booths. Fridays’ new 10,000-square-foot restaurant is a light-filled terrain of blond wood. The bar (still a focal point) now includes stations for juices and coffees. An open deli case offers a variety of grab-and-go salads and sandwiches. Now open at 7 a.m., the eatery features Wi-Fi-equipped areas for the laptop crowd. And later at night, Fridays presents live events, including bands, trivia and open-mic nights. It’s certainly about delivering results. In 2014, longtime owner Carlson sold TGI Fridays for $800 million to a pair of private-equity firms. 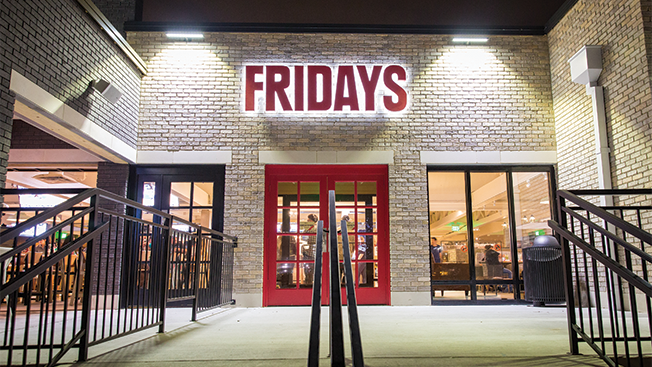 For years now, nimble newcomers in the so-called fast-casual segment have given indigestion to casual-dining concepts, and TGI Fridays is among the oldest of those. Indeed, Fridays pioneered the idea of the well-mannered singles bar with a full menu in 1965, when the first Fridays opened in New York on the corner of 63rd Street and First Avenue. And though the chain has had plenty of face-lifts and menu redesigns since then, the basic concept is long overdue for radical surgery, according to Darren Tristano, president of restaurant consultancy Technomic. The subtext here, of course, is that all older chains (maybe all chains, period) need to cater to millennials, who purchased $2.45 trillion in goods and services last year, according to You Brand, and who look for greater flexibility in their dining destinations. According to Tristano, they also expect up-to-date technology. It’s surely no coincidence that Fridays’ new prototype also includes Wi-Fi, Apple pay, digital reservations and servers equipped with tablets. Thus far, he adds, customers appear to think highly of the new location—though it’s only been a few days since he cut the ribbon. “We’re going to learn from this and apply that learning as we go,” Gies said. This entry was posted on Wednesday, March 23rd, 2016 at 10:00 am and is filed under Uncategorized. You can follow any responses to this entry through the RSS 2.0 feed. You can leave a response, or trackback from your own site.